Over the last 25 years, we have collected Civil War documents that have had significant historical importance or that were just "cool". We collected by regiment, though good autographed material was always a pleasant find. In order to concentrate on Massachusetts Regiments, we are putting some of our collection for your review. 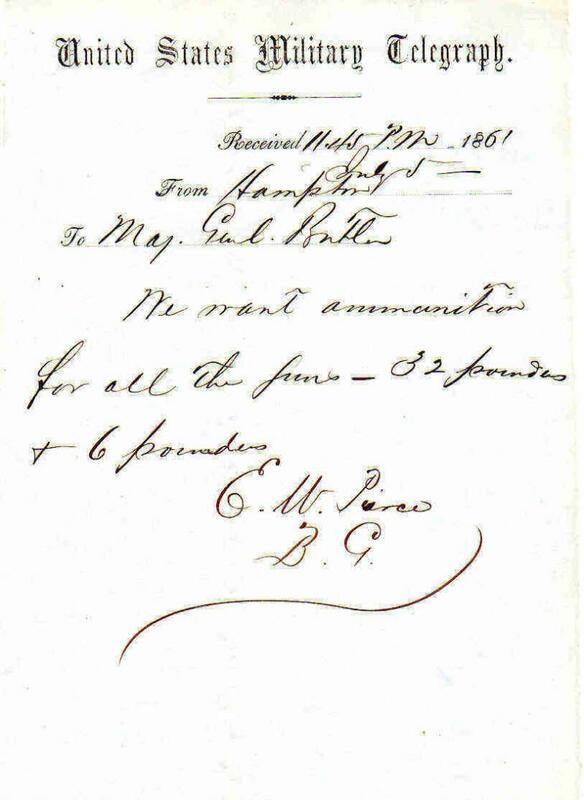 This a wonderful, original letter dated 1848, written and signed by Brigadier General Charles Devens, requesting a fife for the 11th Company of Infantry out of Deerfield, Massachusetts. Letter is 8x11, folds, else in fine shape. Devens was promoted to brigadier general of volunteers in April 1862 and assigned command of the 1st Brigade/1st Division/IV Corps. He was again wounded at the Battle of Fair Oaks in May. His brigade was not heavily involved in the Maryland Campaign. Shortly afterwards, it was reassigned to the VI Corps. Devens commanded the 2nd Brigade/3rd Division/VI Corps during the Battle of Fredericksburg. Assigned command of the first division in the XI Corps, Devens was again wounded, this time at the Battle of Chancellorsville in May 1863. His inattention of the exposed right flank of the division helped Stonewall Jackson launch his flank attack on the corps. Devens's failure to react to early warnings of Jackson's flanking movement may have been due to his heavy drinking in an attempt to dull the pain of a previous injury. Devens later distinguished himself at Battle of Cold Harbor, while commanding the 3rd Division/XVIII Corps in Ulysses S. Grant's Overland Campaign. During final stages of the Siege of Petersburg, he commanded the 3rd Division of the XXIV Corps. Devens' troops were the first to occupy Richmond after its fall in April 1865. 1861, General E.W.Pierce, Fort Monroe, military telegram requesting cannon rounds, 32 pounders. 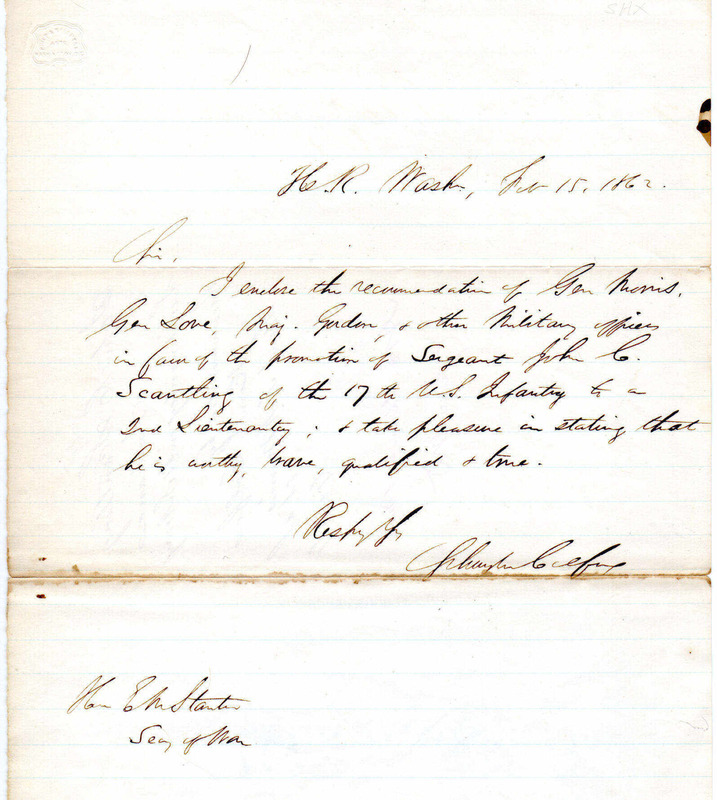 This is a wonderful, original document dated 1861, where General Ebenezer Pierce has written a hasty telegram to General Benjamin Butler requesting ammo for the 6 and 32 pound cannons. At this time, Pierce was stationed at Fort Monroe. Telegram is 6x9, folds, else in overall fine shape. Ebenezer Weaver Peirce (April 10, 1822 – August 14, 1902), was a brigadier general in the Massachusetts militia, serving as 90–day volunteers in the Union Army in the opening months of the American Civil War, and a colonel of the 29th Massachusetts Volunteer Infantry Regiment of the Union Army between December 1861 and July 1864. In 1861 Peirce was a brigadier general in the Massachusetts State Militia. Serving under Major General Benjamin F. Butler at Fort Monroe in Virginia, he was in direct command of the Union forces at the Battle of Big Bethel in June, 1861. On December 13, 1861, Peirce joined the volunteer forces as colonel of the 29th Massachusetts Infantry Regiment. His regiment was located at Fort Monroe and was involved in the battle of Hampton Roads. 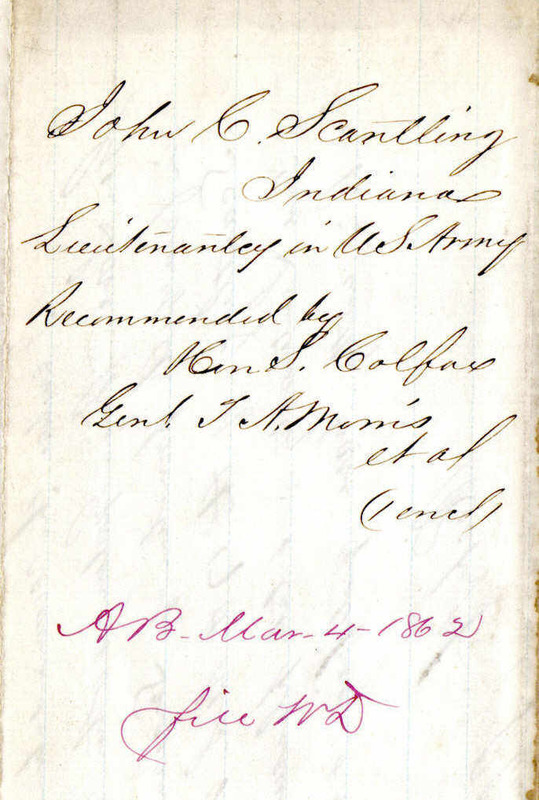 This is a wonderful, orginal document dated 1862, where Vice President Schulyer Colfax has approves the promotion of John C. Scantling. 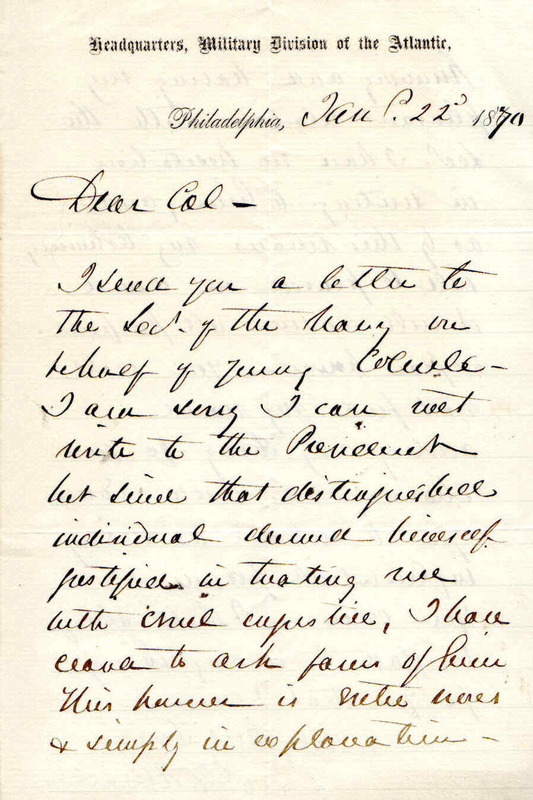 Written and signed by Colfax, letter is 8x11, folds, toned along fold lines, else in overall good condition. Schuyler Colfax, Jr. ( March 23, 1823 – January 13, 1885) was a United States Representative from Indiana (1855–1869), Speaker of the House of Representatives (1863–1869), and the 17th Vice President of the United States (1869–1873). To date, he is one of only two Americans (John Nance Garner in the 20th century being the other) to have served as both House speaker and vice president. 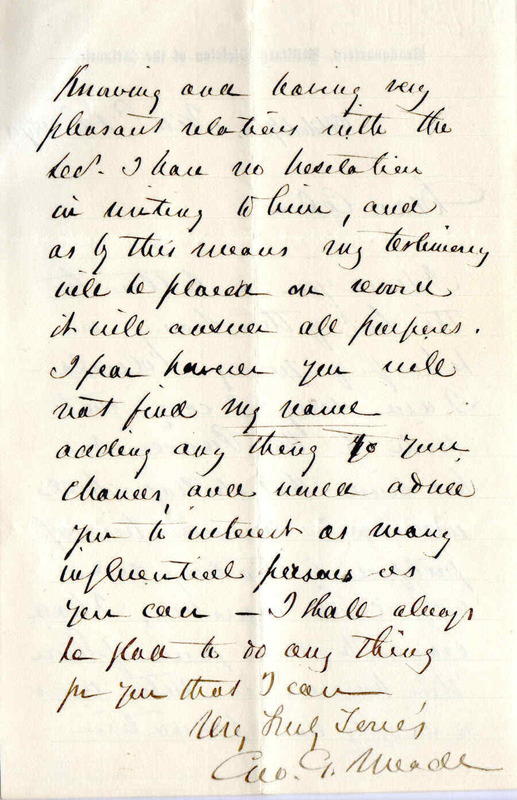 This is a wonderful, original letter, dated 1870, Headquarters, where General George Meade has written to Calvin Alexander regarding his not asking the President for or the Secretary of the Navy for a favor due to the cruel injustice that has been done to him...his name in Washington no longer carries any weight and it would be best if Calvin write several letters....though he will help him in ant way possible...signed Geo. G. Meade. Letter is single sheet, double sided, 7x9, overall fine shape. 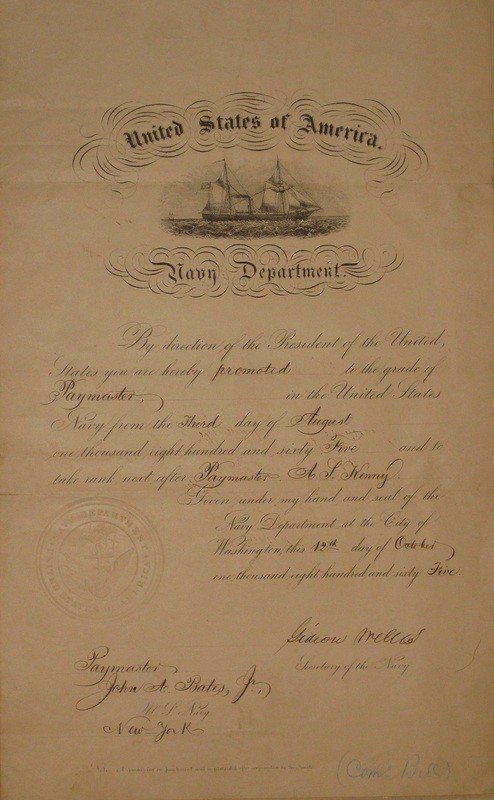 George Gordon Meade (December 31, 1815 – November 6, 1872) was a career United States Army officer and civil engineer involved in coastal construction, including several lighthouses. He fought with distinction in the Second Seminole War and the Mexican-American War During the American Civil War he served as a Union general, rising from command of a brigade to the Army of the Potomac. He is best known for defeating Confederate General Robert E. Lee at the Battle of Gettysburg in 1863. This is a wonderful, original and extremely scarce document, where members of the Georgia Fireside Guard have posted a bond with the Governor of Georgia a few short weeks after the start of the Civil War. The uinit has elected Luther H.O. 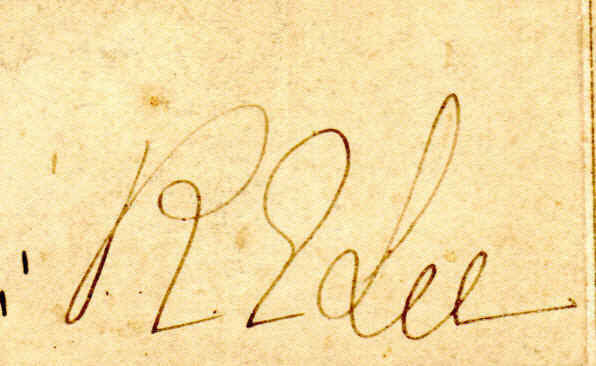 Martin as captain of the regiment...signed by Luther H.O. Martin, Robert M. Heard, Powhatan B. Bourne and James H. Lofton.Document is 9x12, paper clip mark at top, else in overall fine shape. 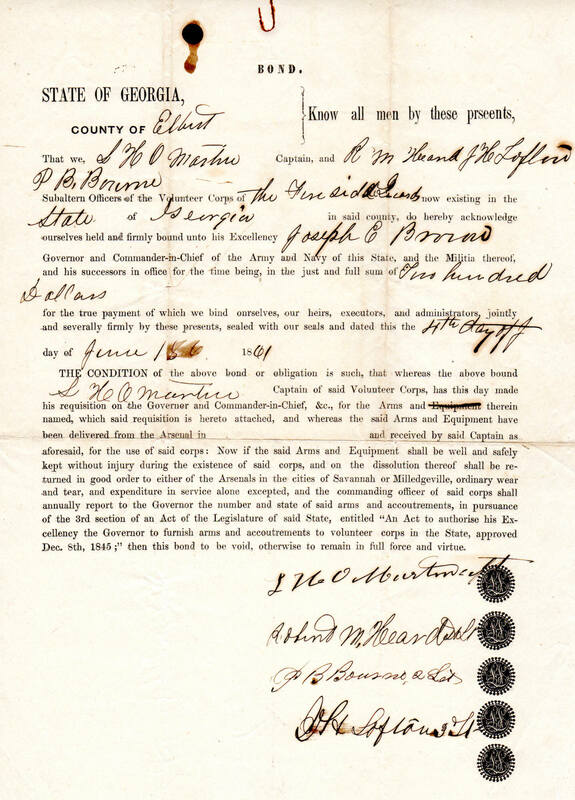 Extremely rare Confederate bond at the start of the Civil War. Worthy of the finest Confederate collections. 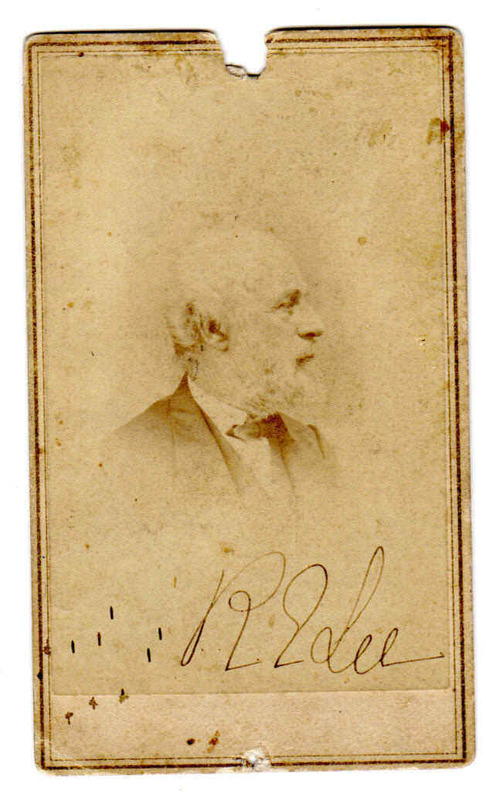 ROBERT E. LEE Signed CDV quarter-length profile portrait vignette in civilian attire, ca. 1866. Boldly signed at bottom photographic image. 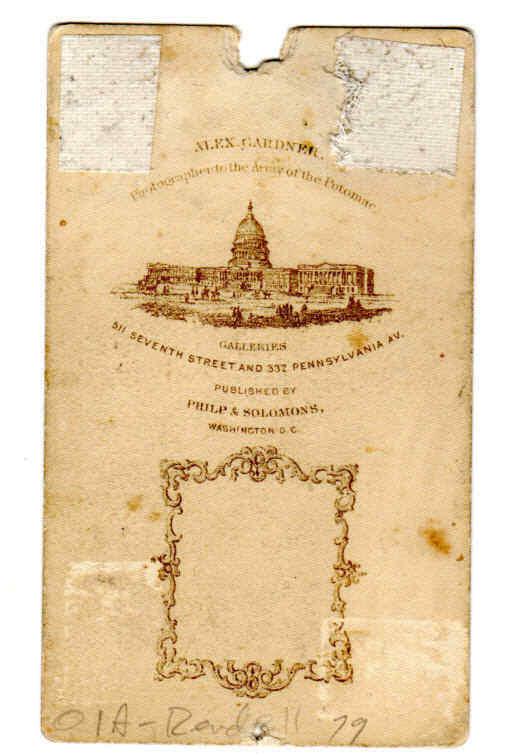 Attributed to Alexander Gardner, "Photographer to the Army of the Potomac," Washington, DC, on backstamp. Light general toning;two faults at top and bottom from what seems to be tack or small nail holes; occasional light soiling; else VG/Fine example with clear signature area. Back has mounting traces from previous framed work of famed collector Leon Becker. 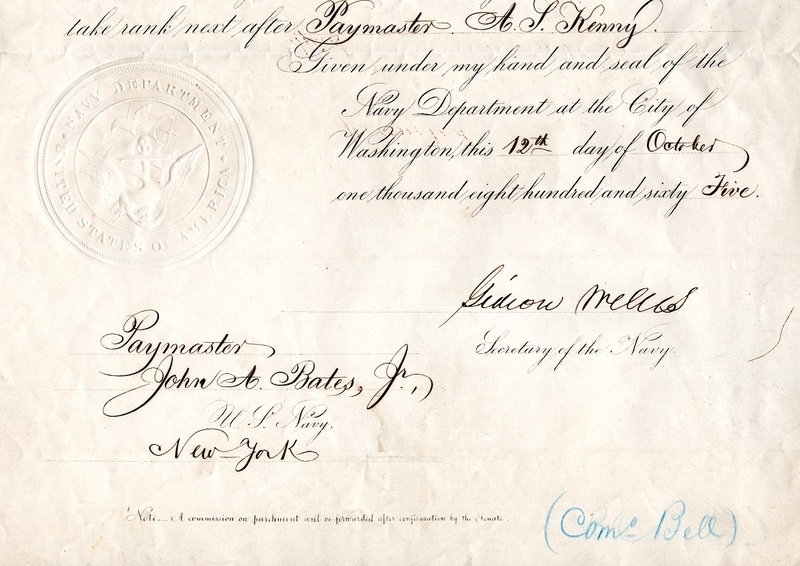 This is a wonderful, original document dated 1865, where John A. Bates has been promoted to Navy paymaster...signed at lower right by Gideon Wells as Secretary of the Navy. 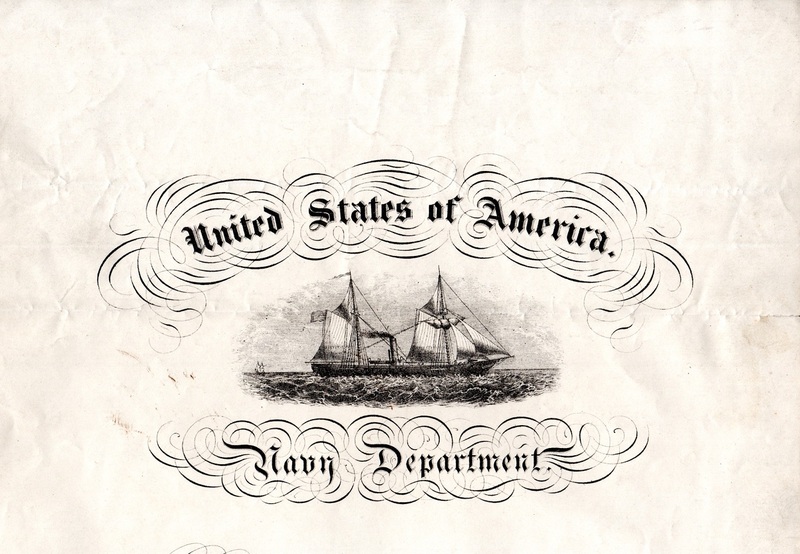 Document is 14x18, displays well, folds, else in overall good condition. Gideon Welles (July 1, 1802 – February 11, 1878), nicknamed "Neptune", was the United States Secretary of the Navy from 1861 to 1869, a cabinet post he was awarded after supporting Abraham Lincoln in the 1860 election.